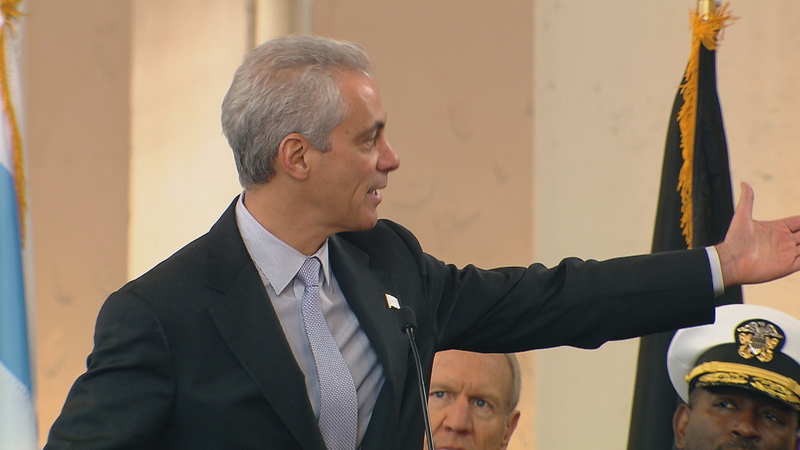 Mayor Rahm Emanuel announces increased CHA help for veterans at Wednesday's Veteran's Day ceremony at Soldier Field. As part of Mayor Rahm Emanuel’s plan to end veteran homelessness in Chicago, Emanuel and the Chicago Housing Authority announced on Wednesday a three-year plan that will provide 450 additional housing-choice vouchers for homeless U.S. veterans. The initiative will provide up to 150 vouchers per year through 2018 and will house veterans who are enrolled in Supportive Services for Veteran Families, a program that provides support services for low-income veteran families living in or transitioning into permanent housing in order to increase housing stability. The SSVF program is funded by the U.S. Department of Veterans Affairs and is administered through various local nonprofits. The CHA currently has 1,053 Veterans Affairs Supportive Housing vouchers and also supports 253 homeless veterans through its Property Rental Assistance program, which includes services that are provided by six properties and four developers. The CHA Board of Commissioners will vote on the 450 additional vouchers at its monthly meeting Tuesday, Nov. 17. Gov. Bruce Rauner greets a veteran at Wednesday's Veteran's Day ceremony at Soldier Field. In other veterans housing news, construction remains halted on a five-story, $70.5 million veterans home in Chicago’s Dunning neighborhood that will provide nursing and health care services to 200 veterans. The home will be the fifth facility in Illinois and the first in Chicago. State officials broke ground on the veterans home in September 2014 under the Quinn administration and construction was halted this past June by the Rauner administration due to the Illinois budget stalemate. The opening of the home has been delayed six months from July 1, 2016, to Jan. 1, 2017.